On the sign are images of Bishop Odo, strawberries, Hadrian and an oak. Regarding the Roman connection, Crofton Roman Villa (near Orpington station) is the only villa open to the public in Greater London. It was inhabited from about AD 140 to 400 and was the centre of a large farming estate. The strawberries highlight the area’s former importance for fruit growing, whilst Bishop Odo used to own the manor of Crofton at the time of the Domesday Book. 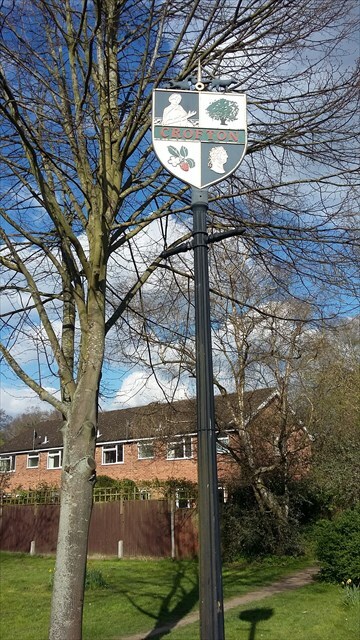 In respect of the oak, there used to be an oak tree, known as the Crofton Oak, standing at the junction of Crofton Avenue and Crofton Road. It was many 100s of years old and was a local landmark. One day it was hit by a furniture lorry and cut down very soon after by the council. It is understood that the busy road junction and the fact the tree was “in the way” fuelled speculation that this was no ordinary accident. 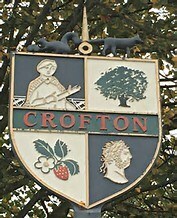 Village sign 1Crofton village sign.